Expectations vs. Reality – that has been quiet a big deal in my last two weeks. No matter what you imagined before you start an adventure like this, your expectations will never be fulfilled. I tried to avoid having too high expectations by just having none; which implies that I didn't inform myself properly before I came to the ranch. Obviously this was no good deal. The keywords at Chilcotin Holidays are „flexible and adaptable“. Depending on the circumstances and the environment, you should be able to change your habits and fit in anywhere. On my very first day at the ranch, I wanted to go back home straight away. Everything was new to me: the team, the environment (especially the fact that the next small town is a two-hour drive away and sleeping in a tent for the first time didn't help either), the workload and the responsibilities you have here. I wasn't used to anything like this before and it was way beyond my expectations. The team welcomed me to „the big family“ from the first day on, which was very supportive for me. With entering the community I became an important part of the group and instantly realized that I have to get active to grow in the team. After a few days it seemed that being adaptable was no problem for me at all. I love the fact that each group member is valuable for each other and we are aware of the fact that we only function as a team. When I arrived at the ranch, I had to read through our 4 employment binders and fill out some paperwork. That seems to be a massive workload at first, but you will see the sense after several days of working. Over 5000 interns have worked at Chilcotin Holidays and developed certain procedures to increase the effectiveness of their work departments, accordingly we have at least one procedure binder for each department the ranch operates. The goal is to follow the existing procedures at first, but the next step is that you're able to see room for improvements and finally develop your own work methods. You may not realize that in your first week, but this is a great opportunity for your self-development as well. Talking about work procedures, my first work impression at the ranch was about cleaning and cooking. Though I worked as a chamber maid in a hotel for five years, I had no idea of the standards at Chilcotin Holidays. I had an introduction on how to clean up the rooms, but still I was unsure about the expectations they have. After a while I realized that the answer is a question: What are my own expectations? Judging my own work has never been my favorite, but here you learn that nobody will judge you or your work but yourself. As long as you give your best to fulfill your own high standards, you're on the right track. No one will look at the rooms and criticize the imperfection of how you made the beds, because nobody here is perfect and everyone improves skills day by day. Our goal is not perfection, we aim to develop and grow by our mistakes, because this is the most effective way of learning. "Work“ is a very flexible word here. Each team member has a daily work schedule, with the standard amount of 8 working hours per day. But on a ranch, unpredictable things happen quiet often. One morning I worked in the office and got several phone calls, that some of our horses would run around in our neighbours backyards (whereas neighbours means a 30 minute ride). As we are flexible and adaptable here, I had to grab two of my team members, a few saddles and bridles and a car to drive down the street, looking for our sneaky 4 legged friends. This way, I skipped some of my office time to have an adventurous morning ride. 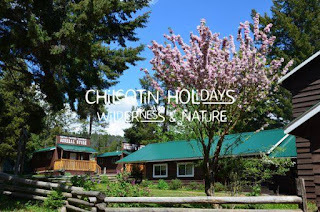 This is just one of the many opportunities that life at Chilcotin Holidays offers every day, all you have to do is to take initiative and use them. After your regular working day, there is still a lot to do on a guest ranch. Cleaning the kitchen, chasing up our horses or spending time with our guests, but also these activities can implement many opportunities. A few days ago, two team members saw a grizzly mum with her 3 cubs when they brought the horses to their field. When our guests want to do target shooting, you spontaneously shoot a real gun for the first time of your life. Or when somebody's interested in logging, you get the chance of participating at the chainsaw orientation. Nobody forces you to do all these things, but if you're willing you can explore more things here than you ever imagined. There' s a lot I learned in only two weeks at the ranch, so I can only assume how much more I will accomplish within 6 months at this incredible place. And one thing I can say for sure is, that coming here for my internship was the best descision I could make for achieving things I never thought I would be capable of!